We recently spoke to FastCo Design about the new app sounds we created for Tinder and what’s involved in creating a brand’s sound. To help Broods promote their latest single release ‘Heartlines’, and their upcoming headlining US tour, we worked with Microsoft to develop a technology solution that would bring the song to life. Using the Microsoft Band, the fitness tracker measured lead-singer Georgia Nott’s heart rate as she performed in the video, translating her biodata and energy into a stunning geometric display. We transformed the band’s energy and emotion into a corresponding visual show, creating a data-driven, bio-interactive concert. A first-of-its-kind integration, fans got to experience the Band powered visuals in real-time when Broods took the technology on the road for their headlining U.S. tour. The Microsoft Band collected information from the artists as they performed and translated that data into visuals in real-time, creating a new level of intimacy with the audience and a one-of-a-kind live music experience. See more on Microsoft’s Music X Technology program here. We are thrilled and honored to have won our first ‪‎Cannes Lions‬ awards! 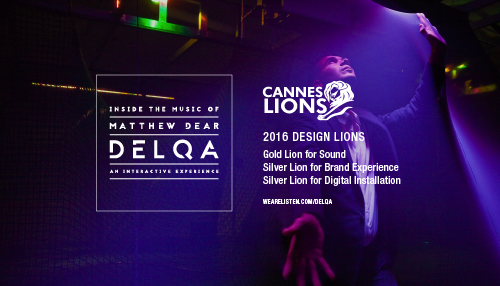 Our project DELQA with Microsoft has received a Gold Lion for Sound and two Silver Lions for Brand Experience and Digital Installation. 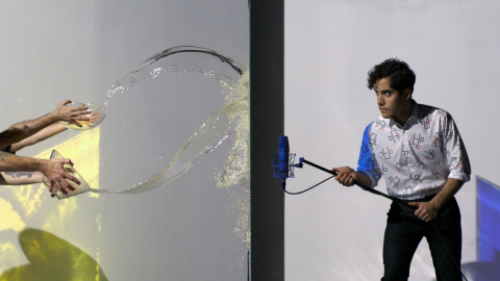 DELQA is an installation that invites the audience to physically go inside the music of critically-acclaimed music producer and artist Matthew Dear. Using Microsoft Kinect technology, participants can manipulate their surroundings as they explore an ever-evolving world of music and sound. Both the visuals and the music respond intuitively to audience movements and interactions. For our latest ‪‎Music X Technolgy‬ project with Microsoft we went to Moogfest to catch up with their future thought leaders to discuss the music & technology landscape. As part of the conversation Amos Gaynes (Moog Music Product Specialist), Onyx Ashanti (Sonocybernetic Patternist), EMA (Musician and Multimedia Artist), and Josette Melchor (Gray Area Founder) discussed Moogfest, the music & tech community, and how projects like Realiti – Inside the Music of Grimes are pushing the boundaries of the music experience. Realiti – Inside the Music of Grimes was an environment that celebrated music, art and technology by offering fans a unique chance to remix the track ‘Realiti’ by Moogfest headliner Grimes. Redefining the music experience, the installation invited visitors to manipulate their surroundings as they explored an ever-evolving world. We recently caught up with Big Grams (Big Boi & Phantogram) to see how they use Microsoft’s Kinect technology to create an immersive visual experience for their unique live shows. Big Grams worked with new media and entertainment studio V Squared Labs to develop this experience, which is triggered by the band’s movements on stage. The result is a spectacular interactive backdrop that was custom made to compliment Big Grams’s energetic performance, bringing fans into their world. To celebrate the opening of KEXP’s New Home, we worked with KEXP and Microsoft to create an interactive installation inviting the audience to physically go inside the music of KEXP. Using Microsoft’s Kinect technology, participants remixed songs by favorite KEXP musicians alt-J, Floating Points, Olafur Arnalds and Samaris. Both the visuals and the music responded intuitively to the audience’s movements and interactions in the ever-evolving environment. As people moved through the installation, they continuously reshaped and customized the music, blurring the line between creator and audience. The installation was part of our ongoing work with Microsoft for their Music x Technology program, created to explore emerging modes of artistic expression and celebrate advances in interactive technology. Spring Moves is the world’s first ‘sonic-energy company’, combining music and technology to make people live better by working out better. Their first product – the Spring app (iOS) – is a rhythm fueled music service and exercise tracker. Think Pandora meets Fitbit. For the launch, Spring Moves asked us to take their mission of “realizing human potential through the power of music and technology” and translate that into a musical brand anthem. We are proud to have been the Project Lead for a new interactive photography project that profiles forward-thinking musicians who have created compelling and innovation work using Microsoft technology. Shot by Satellite Lab founder and artist Carlo Van de Roer, the portraits are an homage to Microsoft’s recent creative collaborations with critically acclaimed DJ/producer Matthew Dear, electronic pop duo Phantogram, and electronic music band Neon Indian, capturing them in a moment of creating sound. The result of the project is a series of interactive portraits in which the viewer can become participant by controlling and moving light-sources within the image – enabling them to explore and discover the content, context and details of a moment in music. Each set was tailored to the individual style of the artist, who have all used the Microsoft Kinect to create engaging music experiences.